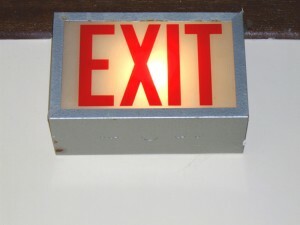 Once in a while we will hear about a preacher who has announced that he is “leaving Fundamentalism.” This is never good news, and it provokes several questions. It also calls for a response from those who are wiser. The book of Proverbs contains in its twenty-sixth chapter two precepts in consecutive verses that seem to contradict each other. Verse 4 tells us not to answer a fool according to his folly, and verse 5 tells us to go ahead and answer a fool according to his folly. Of course these divinely-inspired wise sayings do not contradict each other but instead present two legitimate responses to a fool’s folly. One way to respond to folly is to reject the very premises upon which a fool’s statements are based, “lest thou also be like unto him.” The other way is to accept for argument’s sake the wrong premises of the fool and then turn his foolishness back on him. We find examples of both these approaches in the recorded words of Jesus responding to inquirers and critics. We also find both approaches in the New Testament epistles. The first approach, not to answer a fool according to his folly, is the right one for dealing with the “leaving-Fundamentalism” kind of foolishness. Now nobody has a right to call someone else a fool. The Lord made this clear in Matthew 5:21-22. However, His point was not that there is no such thing as a fool. Very many Bible passages describe fools. He was saying that nobody has a right to say to his brother, “Thou fool,” because everybody plays the fool from time to time. Even the human writer of the Proverbs played the fool. So we do not have the right to belittle others by calling them fools. However we have occasions to rebuke folly and hope to recover people from it. There is folly in “leaving Fundamentalism,” and we ought to examine it in the light of the wisdom of God. What shall we say to such an announcement, whether it comes from a preacher, from a young man entering the ministry, or from a Christian family leaving a church? First of all, let us recognize the veiled pride in such an announcement, and respond by saying, “So what?” Why is it important for us all to know that this person is making such a change in his life and ministry? What great consequences will result from his change and his announcement, and why should the Christian world sit up and take notice? Perhaps we have made too much of the unhappy defections from the truth we have witnessed in the past. Perhaps some immature souls are attracted to such things because of the attention it brings to those who commit them. But defection from the truth is no new, cataclysmic event. It is as old as the story of Demas. Defections happen, but they do not hinder the truth. Defections only hurt the defectors, and those who pay attention to them. If a believer for conscience sake must leave an organization, withdraw approval from a ministry or a minister, stop cooperating with somebody, or take some stand, let him simply do it, and not say things to cast reflection on Fundamentalism, a legitimate spiritual movement, “lest haply ye be found even to fight against God” (Acts 5:39). One man’s “leaving Fundamentalism” will do no harm to Fundamentalism itself. We wonder what the brother means by saying he is “leaving Fundamentalism.” Although there is a human religious movement called the Fundamentalist, and also distinct movements legitimately labeled Fundamentalist, Fundamentalism itself is not a human movement, but rather a divine truth. A hundred years ago there was a grass-roots uprising in the evangelical American denominations to oppose the infiltration and influence of Liberal theology in their churches. Those who joined the protest were called Fundamentalists. They spoke out based on the premise that Christianity is not defined by a certain spirit, or by certain experiences, or by a certain way of living, or even by the teachings of Jesus as they apply to society, but rather by certain fundamental doctrines. These doctrines are the tenets of the Gospel, as spelled out in First Corinthians 15 and other New Testament scriptures. They are not only truths to be believed, but also the pillars on which Christianity stands. The Fundamentalist insists that the doctrines of the Gospel (including the authority of the Bible, the deity of Christ, His blood atonement, His bodily resurrection, and justification by faith alone) are fundamental to Christianity. In other words, without all of them, religion is not Christianity. Machen correctly contrasted Christianity and Liberalism. Something that is fundamental to something else is essential to it. Fundamentalism is the insistence that the fundamentals of the faith are fundamental to the faith. Men and movements are properly defined by their actions as well as their words. We are to “walk in the truth” (Second John 4 and Third John 3 and 4). Evangelicals who treat Liberals (who by definition reject certain of the fundamentals) as Christians by yoking with them in denominations, ministerial associations, evangelistic efforts, public declarations, and joint services are not Fundamentalists even if they will argue with you about it (Second Corinthians 6:14-18). Fundamentalism is the dividing of light from darkness, and is nothing but a good thing. Is that what our disillusioned brethren are leaving? Now, as we have noted, there is a movement correctly labeled Fundamentalist. However it is not the monstrosity invented and mislabeled by academia and media. About twenty years ago, anti-religious teachers and writers began calling the conservative wing of any religion “fundamentalist.” The P.B.S. broadcast a series of programs on what they called “fundamentalism,” which according to these shows is basically a mental illness. They diagnosed Christian fundamentalism, Jewish fundamentalism, Hindu fundamentalism, and Islamic fundamentalism as a mindset of fear, suspicion, anti-intellectualism, hatred, and fanaticism. It is and was an unfair and untrue definition of an historic and specifically Christian movement in the United States. Now the media calls the violent radicals of Islam “fundamentalists.” In a strictly historic sense, there is no such thing as Islamic fundamentalism. Fundamentalism is a distinctly Christian movement. The new and popular way of defining Fundamentalism is intellectually dishonest. It is also dishonest to define Fundamentalism by just one of its many fellowships or networks. The Fundamentalist movement of the early twentieth century has evolved and splintered into many diverse but truly fundamentalist movements. Some who think they are “leaving Fundamentalism” are actually disassociating themselves from one grouping of Fundamentalists. Their mistake is understandable because some such groups try to define Fundamentalism itself as their own group (see the warning in Luke 9:49-50). What are you saying when you say you are “leaving Fundamentalism”? Do you mean that you are quitting a fellowship, or renouncing a Bible college, or disagreeing with a church or ministry? If that is what you mean, just make the break you need to make (according to Ephesians 5:11), and don’t give the impression that you are leaving the truth of the Gospel and of separation to the Gospel. There is nothing wrong with Fundamentalism, although the men who have espoused it have been flawed, and the human movements that have promoted it have sometimes gone astray. The men and organizations you have defined as “Fundamentalism” are not what you are calling them. Fundamentalism is a far greater thing. Whatever the people are doing who are “leaving Fundamentalism,” it is bad. “Leaving Fundamentalism” inevitably means backing off from policies and principles that have characterized those who stood most faithfully for the Bible in our lifetime. The mainline denominations have not stood for the Bible or the Christian faith. Broad evangelicalism has not really stood for the Truth, although they work to spread it. Fundamentalism is contending for the faith, and good men have paid a great price to follow it. The ministries and crusades of men like Torrey, Riley, Shields, Ketchum, Jones, McIntire, Vick, and Clearwater ought to be honored and appreciated by all who love the truth. What a man is leaving if he leaves Fundamentalism is something he should not leave. In some cases he is rejecting separatism in some form of its application. Let everyone beware who considers abandoning Biblical separation. It is a scriptural principle, and walking away from any policy that has been based upon it should not be done without considerable study and seeking of counsel. Just because a non-separatist challenges separatist policies does not mean that his criticisms are valid. Our spiritual forefathers had amazing insights, and none of their policies or practices should be discarded lightly. In some cases he is rejecting personal separation while holding on to some degree of ecclesiastical separation. Men who are doing this want to call themselves “historic fundamentalists,” pointing out that the original Fundamentalists fought over such cardinal doctrines as the Virgin Birth, the Bodily Resurrection, and the Inerrancy of Scripture, and not over such comparatively small issues as dress, music, drink, amusements, and Bible versions. They like to label those who do fuss over these issues “old-time fundamentalists,” using the label in a condescending manner. They like to label issues of personal separation (holy living) as “non-issues” because the Fundamentalists of 1910-1930 never wrote about them. But the scripture says that there are kinds of behavior which “become [are becoming or suitable to] sound doctrine” (review the epistle to Titus). Early Fundamentalists did not argue for modest dress, but what did their women wear? They did not denounce sensual music in church, but what kind of music did they use? They did not make an issue over English translations, but what version of the Bible did most of them use almost all the time? Because they did not preach sermons on these issues does not mean that the original Fundamentalists would have gone along with the horrible changes in practice that the past hundred years have brought into the churches. And these smaller issues actually do relate to the great issues, and are legitimate matters of concern. In some cases the defector is parting from evidence of carnality in some of the Fundamentalists he has known. But Fundamentalism should not be rejected because Fundamentalists need revival. Tell us what you mean. Surely you do not mean that you are giving up truth because men who have taught it have been found to be less than spiritual all the time. Many Fundamentalists are sincere and holy people, although some have been found to be less than so. Fundamentalism should not be abandoned just because Fundamentalists need revival. In some cases, the one making the change has come to view certain issues in ways contrary to his former views. But he is not really “leaving Fundamentalism.” However, he may be making the big mistake of abandoning the wisdom of the godly of former days and jumping to conclusions that are wrong. Paul warned the Corinthians not to take lightly the issue of male and female hair-length and head-covering because the change in policy some wanted to make was contrary to the “custom” of the “churches of God” (First Corinthians 11:1-16). We are not to “despise [belittle]…the church of God” (First Corinthians 11:17-34) or its customs. Give the views of Fundamentalists and the practices of the Fundamentalist churches the benefit of the doubt. Fundamentalism has a wonderful future because it is based on the truth of the Bible. Nobody should leave it now for any reason. If Bible-loving people will yield their lives to the truths they believe, we will see a revival sweeping the family of God all over the world. Don’t leave. Kneel and pray with us as we seek the blessing and power of the God of our fathers! Thanks Bro. Flanders for a very thoughtful article. …but aren’t those who “leave Fundamentalism” practicing separation as well? Old Time Separatists Baptists are not fundamentalists. Fundamentalism doesnt have baptism or the Lords Table as part of the fundamental doctrines essential to the faith, Without Baptism and the Lords Supper (Closed Communion)you have no local church, and without a local church you have no authority to preach the gospel. It would be interesting to know your viewpoint on Alien Baptisms and Closed Lords Table.